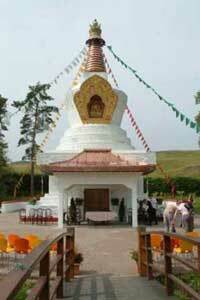 The Victory Stupa is at Kagyu Samye Ling Monastery and Tibetan Centre at Eskdalemuir in the Scottish Borders. It was inspired by the founder, Akong Tulku Rinpoche and Abbot, Lama Yeshe Rinpoche, to benefit all beings and to protect the world from the causes of war, epidemic diseases, famine, pollution and poverty. The project started in 1996 and over 2000 people have helped financially or with practical skills to help build the Samye Ling Victory Stupa. Those who prepared the inner contents took vows, if they were not already ordained, for the duration of their task. From the outset the project was directed by a Tibetan Lama who was a lineage holder of the Stupa tradition and in the Summer of 2000 more Lamas came from India and Tibet to consecrate the Stupa and hold two weeks of 24 hour prayers for World Peace. This also marked the 60th Birthday of Akong Tulku Rinpoche. Although the Samye Ling Stupa itself will soon be completed the Stupa project is part of a wider vision. 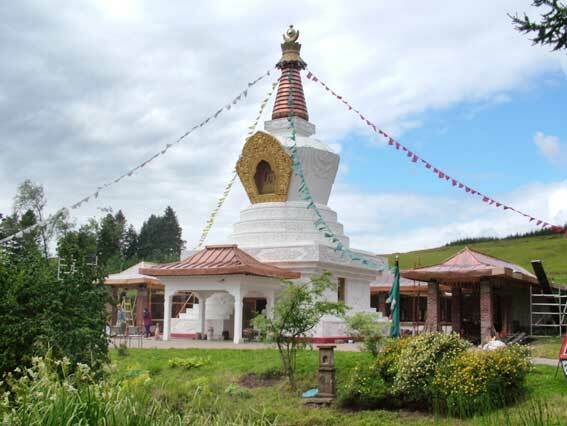 Many smaller Stupas have already been built at Samye Ling and on Holy Island, just off Arran on the West Coast of Scotland where a large Stupa is planned for the future. As founder of the charitable trust Rokpa International, Dr Akong Tulku Rinpoche, wishes to build 108 stupas to mark historically and culturally important places in Tibet that might otherwise be forgotten to protect and preserve Tibetan culture for future generations. Each protected site will also provide a history carved on a stone pillar and a shelter for tourists, and pilgrims, where prayers can be said and picnics enjoyed. "I go every year to Samye Ling, the big Tibetan Buddhist centre in Eskdalemuir, Scotland, which is where my teachers live. In fact, my tropical blood froze through five Scottish winters there when I did my long retreat. As this might indicate, there is something more compelling than my Scottish ancestry that still drives me back year after year. For me it is a supercharged place of spiritual energy. 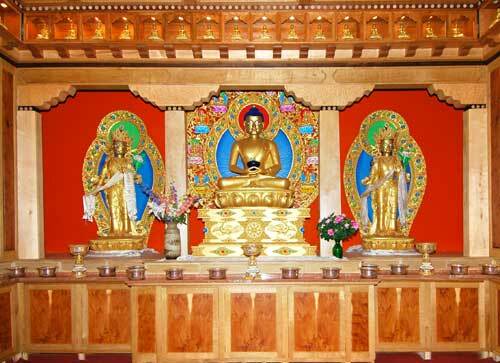 The focus is a huge stupa - the biggest in Europe -, which was consecrated in 2000."